The Politically Correct Christian church of the 21st century is impotent as an agent of change in our highly secular society. Lack of Basic Foundational Teaching leaves us ill-equipped to share our faith. Spiritual Warfare is destroying our marriages, our families and our personal faith walks. New Age Influences are being added daily to the teachings in our houses of worship. The body of Christ has become virtually indistinguishable from Secular Society. God's glory is missing from His churches. It is time for Change... change which brings us back to His Word, back to living a holy life as He commanded, and back to a place where we can be a positive influence in today's immoral world. Do you want basic foundational truths? Are you willing to commit to chasing hard after Jesus? If you are, then an "about face" is required. Vicki Renee Bryant is a passionate Bible teacher, Christian speaker and writer for Jesus Christ. She has a consuming love for the Word of God and a passion for those who wear the name of Christ to have that same hunger. 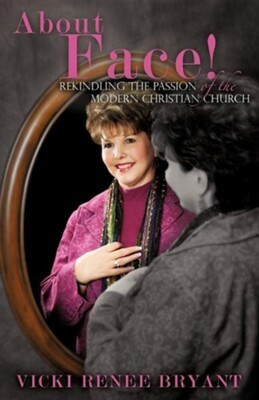 She believes if Christians studied and applied Biblical truths they would influence the world for the cause of Christ. About Face contains a wealth of foundational Christian truths, plus a strategy plan for implementation. For Such a Time as This... was Vicki's first published work. She and her husband Dan own His House, a Bible and gift store, in Owosso, Michigan. I'm the author/artist and I want to review About Face!.